I am declaring this Smitten Polish week here on Never Enough Nails! I in the midst of a serious obsession with this brand right now and Noelie keeps cranking out amazing polishes that I must have. Over the next week, I'll be showing you some of her latest drool-inducing spring polishes. She said on Facebook that she will be doing a restock of the spring polishes, some older colors, and some new spring polishes later this week, so I thought this would help you prepare! 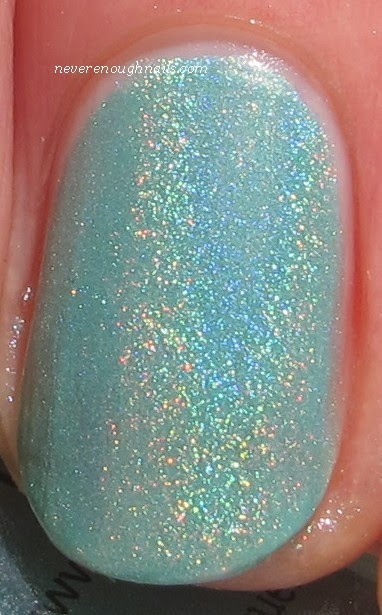 Today's post is Smitten Polish Audrey's Rainbow, a pastel "Tiffany" turquoise blue linear holo. The rainbow effect in this one is a little lighter than other Smitten holos, but it fits the soft color. It's just gorgeous in sunlight! This is three thin coats of Audrey's Rainbow. Two coats was nearly opaque, so if you do thicker coats, two will suffice. Smitten holos are very easy to apply and I have never experience patchiness or balding with them. I don't wear base or top coats with my holos (unless they look like serious stainers). Smitten Polish Audrey's Rainbow should be restocked with other colors late this week on Smitten's Big Cartel store. For updates about restocks, like Smitten Polish on Facebook. While you're on the Facebook page, check out pictures of the upcoming "Tornado Skies"... OMG need it now! !